The Fokker Dr.I, short for dreidecker (triplane), was the German answer to the Sopwith Triplane. The German pilots were alarmed at the superiority of the British triplane to their aircraft. Per the book, Manfred von Richtofen said " the Sopwith Triplane is the best aircraft the enemy has, it has a high climb rate, is more maneuverable, does not lose altitude in turns and is faster in a dive." 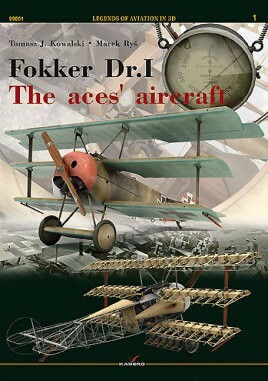 As the book shows, the Fokker Dr.I first appeared in late summer of 1917. The first month's combat testing showed two flaws of the Dr.I. One of these flaws was that the German rotary engines were not as good as the Entente's. Some of the triplanes were actually fitted with captured enemy rotary engines. The second flaw was that the top wing suffered some failures that even caused some fatalities. This was found to be because of moisture, and the subsequent failure of the glue and fabric of the wings. Yes, you read that correctly, these old birds were made of canvas, wood, and sometimes held together with glue; actually, even some World War II planes were. The moisture problem was taken care of by having added ventilation holes in the wing, and an improvement on the seam gluing. The third flaw of the triplane was known even before either side had even produced one. The flaw was the increased drag of a third wing. The world's engineers had known before World War I that a monoplane was the best design for a plane. Unfortunately, they had to make do with what could be produced and actually manufactured at the time. So the Dr.I was as nimble as a cat, but slower than most planes. By 1918, the Entente's fliers had much better aircraft, and could use 'boom and zoom' tactics against the Dr.I. Once the Allied fliers learned not to dogfight a Dr.I, its days were numbered. The slower speed of the Dr.I meant that the German fliers could not break off engagements or escape if things started to go south. The book is separated into two parts. The first thirty-six pages is a history of the plane along with many pictures of Dr.I's during the war. The second part of the book is 103 pages of computerized views of the entire plane's separate parts in detail. Some of these are in 3D, and the book comes with a small pair of 3D glasses. To illustrate the amount of views, there are ten pages alone on the machine guns and ammo bins from all angles. The computerized views will allow any hobbyist to pretty much build a Dr.I from scratch if they wanted to. As with any of the Kagero books you will find not only interesting history, but also jaw dropping illustrations of whichever war machine that is being depicted.